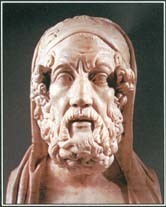 Homer is considered to be the author of the Iliad and the Odyssey, two epics of ancient Greek literature. In any case, the ancient Greeks named Homer as the author of the Iliad and the Odyssey Stories about the poet suggest that he lived in Ionia, a region on the west coast of Anatolia (present-day Turkey). The dates of his life are uncertain, possibly in the 800s or 700s B . C .
See also Greek Mythology ; Iliad, the ; Odyssey, the .